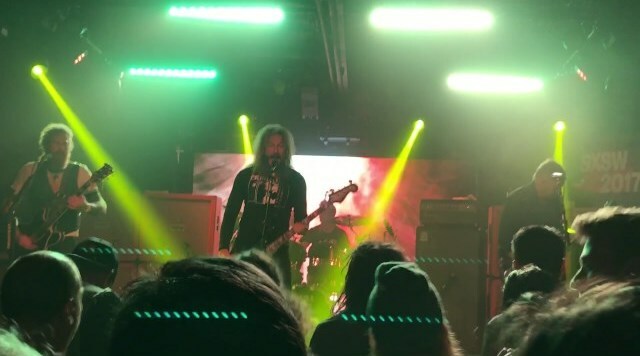 Mastodon delivered the live debut of three tracks from their forthcoming album, “Emperor Of Sand”, during a March 17 performance at the SXSW music festival in Austin, TX, and video from the event has surfaced. The group’s first live show supporting the project opened with the lead single, “Sultan’s Curse”, and also featured concert debuts of follow-up tracks “Show Yourself” and “Andromeda” alongside a mix of classic tunes. Due March 31, Mastodon will launch the record on a spring tour of North America in Missoula, MT on April 14 with guests Eagles Of Death Metal and Russian Circles. The band recorded their seventh album with producer Brendan O’Brien at the Quarry in Kennesaw, Georgia last year. Mastodon recently released a video for “Show Yourself”; directed by Robert Schober, the clip for the second tune previewed from the package features drummer Brann Dailor on lead vocals.